Abdullah is re-signing with Minnesota, Adam Caplan of SiriusXM Radio reports. Abdullah played 16 special teams snaps during Sunday's 24-10 loss to the Bears. Abdullah was targeted once but did not record a catch during Sunday's 24-17 win over the Packers. Analysis: Abdullah has just one touch in two games in Minnesota and, after two kick returns in Week 11, did not bring the ball out on Sunday. The top of the Vikings' stable is pretty set with Latavius Murray and Dalvin Cook. Though Abdullah's speed could conceivably add another dimension to the attack, you should see it before you believe it. The Patriots' bottom-10 total defense looms Sunday, but Abdullah won't get many offensive chances to test it. Abdullah had one reception for ten yards on his only target in Sunday's loss at Chicago. He also returned two kickoffs for an average of 28.5 yards. Analysis: He played just one snap on offense, and he'll be mostly limited to special teams as long as Dalvin Cook and Latavius Murray are healthy. Still, it's notable that he got time on offense while No. 4 RB Mike Boone was inactive. Abdullah was claimed off waivers by the Vikings on Wednesday, Adam Schefter of ESPN reports. Analysis: Abdullah will stay in the NFC North, joining a backfield that already includes Dalvin Cook and Latavius Murray. The 2015 second-round pick isn't likely to be an immediate factor in the offense, but he could get a look on kickoff returns. There's no guarantee Abdullah sticks around for long, as the Vikings may view him as nothing more than short-term depth while Roc Thomas recovers from a hamstring injury. The Lions are expected to waive Abdullah on Tuesday, Ian Rapoport of NFL Network reports. Abdullah (coach's decision) is inactive for Sunday's game at Minnesota. Analysis: Abdullah has put an end to a three-game active streak, during which he recorded three touches for 19 yards from scrimmage and fumbled one time on his four kickoff returns. The latter may have played a part in Abdullah donning street clothes Sunday, but the real impetus likely is Theo Riddick (knee) returning from a two-game absence. Abdullah didn't receive a carry but logged six yards on his lone reception and 77 yards with a fumble on three kickoff returns during Sunday's 28-14 loss to the Seahawks. Abdullah (ankle) practiced fully Thursday, Tim Twentyman of the Lions' official site reports. Abdullah was limited in Wednesday's practice due to an ankle injury, Michael Rothstein of ESPN.com reports. 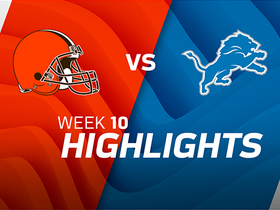 Analysis: Abdullah played his first offensive snaps of the season during Detroit's win over the Dolphins in Week 7, gaining a yard on his lone carry and hauling in a 12-yard reception. If Theo Riddick (knee) is again sidelined Week 8 against the Seahawks, Abdullah would likely have a small role on offense behind rookie Kerryon Johnson and veteran LeGarrette Bount. In order for that to materialize, however, Abdullah must prove that his own injury isn't a concern. Abdullah rushed once for one yard and caught his only target for 12 receiving yards during Sunday's 32-21 victory over Miami. Abdullah could earn some snaps out of the Lions' backfield in Week 7 against the Dolphins with Theo Riddick (knee) ruled out, Tim Twentyman of Detroit's official site reports. Abdullah logged 30 yards on his lone kickoff return during Sunday's 31-23 victory over the Packers. Analysis: Abdullah was active for the first time all season, and he didn't see any involvement on offense. However, Abdullah could be active for additional games in the near future if running back Kerryon Johnson (ankle) or return specialist Jamal Agnew (knee) are still tending to injury after Detroit's Week 6 bye. Abdullah (coach's decision) is inactive for Monday's game against the Jets, Tim Twentyman of the Lions' official site reports. 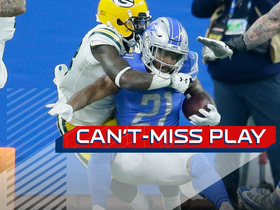 Analysis: The Lions will thus rely upon a trio of LeGarrette Blount, Kerryon Johnson and Theo Riddick to shoulder the workload out of the backfield. With Brandon Powell also a healthy scratch, look for Jamal Agnew to handle returns on both punts and kickoffs. Despite making the Lions' 53-man roster, Abdullah isn't certain to be active for most game days this season, Carlos Monarrez of the Detroit Free Press reports. Abdullah has a spot on Detroit's initial 53-man roster, MLive.com's Kyle Meinke reports. Analysis: The 2015 second-round pick likely will stay in Detroit for the final year of his rookie contract, though it's still possible he could be waived if the team wants to add help at another position. Abdullah doesn't figure to get many touches in a backfield with LeGarrette Blount, Kerryon Johnson and Theo Riddick soaking up snaps. Abdullah didn't make a good impression as the starting running back in Friday's preseason loss to the Giants, MLive.com's Kyle Meinke reports. Abdullah is listed as the first-string kick returner on the Lions' initial depth chart. General manager Bob Quinn said Abdullah will have to compete for his snaps ahead of the 2018 season, Michael Rothstein of ESPN reports. Abdullah has had a full offseason to train for the first time in his career, Dave Birkett of the Detroit Free Press reports. "Definitely ready for a big year," the running back recently said. "My body feels as good as it's felt since I've been here, so I think that's the most important thing. I've had an unfortunate streak of two injuries in a row. Coming back from those have been tough in their own respect, but I'm glad I'm all the way back." Lions general manager Bob Quinn said he has big hopes for Abdullah in 2018, Michael Rothstein of ESPN.com reports. 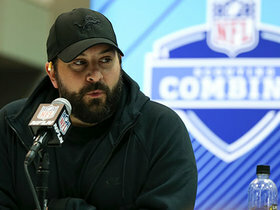 Abdullah will need to prove himself to the Lions' new coaching staff, ESPN.com's Michael Rothstein reports. Abdullah carried eight times for 18 yards and one touchdown during Sunday's 35-11 victory over Green Bay. He also brought in one of two targets for 11 yards. Abdullah rushed six times for 21 yards while catching one of two targets for five yards during Sunday's 26-17 loss to the Bengals. Analysis: Abdullah saw just 11 snaps compared to 40 for Theo Riddick and 13 for Tion Green. He didn't make the most of his opportunities, either, and now owns 3.4 yards-per-carry average on the season. We expect him to remain the Lions' No. 3 runner in the season finale Sunday against the Packers. Abdullah rushed once for eight yards during Saturday's 20-10 victory over the Bears. He also turned three of four targets into 18 yards. Abdullah is listed as active Saturday against the Bears, Kyle Meinke of MLive.com reports. 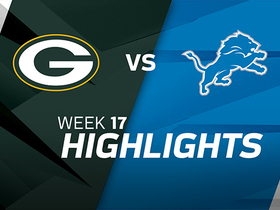 Analysis: Abdullah was a legitimate inactive Week 13 due to a neck issue, but there were rumblings he was healthy enough to suit up last Sunday in Tampa Bay, when he logged a second consecutive DNP. Upon his return Saturday, it'll be interesting to see if he supplants Theo Riddick or even Tion Green in the pecking order. That said, Abdullah won't have to worry about Zach Zenner or Dwayne Washington poaching snaps due to both landing on the inactive list. Abdullah (neck) was listed as a full practice participant on the Lions' injury report Tuesday. Analysis: With his neck injury behind him, Abdullah can focus on getting back in the good graces of head coach Jim Caldwell, who has included the running back among the inactives the past two games. Prior to the absence, Abdullah was averaging a career-worst 3.4 YPC, so the Lions rolled with Theo Riddick and Tion Green at running back. It remains to be seen if Abdullah will do enough this week to regain his perch at the top of the depth chart in time for Saturday's contest. Abdullah (neck) may have been healthy enough to play in Sunday's 24-21 win over the Buccaneers, MLive.com's Kyle Meinke reports. Abdullah (neck) is inactive for Sunday's game at Tampa Bay. Analysis: Sidelined for a second straight week, Abdullah will yield the backfield to Theo Riddick and Tion Green, the latter of whom turned 11 carries into 51 yards and one touchdown last Sunday in Baltimore. Updating a previous report, Abdullah (neck), who is listed as questionable for Sunday's game against the Buccaneers, is not expected to play, a source informed Ian Rapoport of NFL Network. Abdullah (neck), who is listed as questionable for Sunday's game against the Buccaneers, is expected to play, Ian Rapoport of NFL Network reports. Abdullah (neck) is listed as questionable for Sunday's game in Tampa Bay. Analysis: Prior to a DNP last Sunday, Abdullah logged one limited practice. He fit in three this week, but his listing Friday leaves his Week 14 availability up in the air. Another absence would elevate the relevance of running backs Theo Riddick and Tion Green within the Lions offense. Abdullah (neck) practiced in a limited fashion Thursday. Abdullah (neck) was a limited participant at Wednesday's practice. Analysis: Abdullah missed practice last Wednesday and Thursday before returning as a limited participant Friday, but he ultimately was ruled out for Sunday's 44-20 loss in Baltimore, leaving Theo Riddick, Tion Green and Zach Zenner to share snaps in the backfield. It will be hard to have confidence in Abdullah returning to action Sunday in Tampa Bay unless he makes it back to full participation by the end of the week. Abdullah (neck) is listed as inactive Sunday at Baltimore, Kyle Meinke of MLive.com reports. Analysis: A neck injury conspired to keep Abdullah out of practice until Friday, when he participated on a limited basis. Early Sunday, Ian Rapoport of NFL Network relayed Abdullah was trending toward his first absence of the season, and the Lions' inactive list revealed as much. The backfield will thus be headed by Theo Riddick, but Zach Zenner can also be expected to see a number of touches with Dwayne Washington a healthy scratch. Abdullah (neck), who is listed as questionable for Sunday's game against the Ravens, isn't expected to play, Ian Rapoport of NFL Network reports. Abdullah (neck) returned to practice Friday as a limited participant and is listed as questionable for Sunday's game in Baltimore. Abdullah (neck) took part in Friday's practice, Justin Rogers of The Detroit News reports. Analysis: It won't be clear until after practice how much work Abdullah was able to get in, but his participation alone is a positive sign after he sat out the previous two days. The Lions could shed more light on his availability for Sunday's game against the Ravens when they release their final injury report of the week later Friday. Abdullah (neck) didn't participate in practice Thursday. Abdullah was held out of practice Wednesday due to a neck injury. Analysis: Abdullah's production has waned in recent weeks, as evidenced by a combined 17 carries for 36 yards, five receptions (on seven targets) for 42 yards and one touchdown over the last two games. Wednesday's DNP marks his first of the season, so it could be maintenance-related. That said, his status will be monitored closely in the coming days to make sure an appearance is possible Sunday at Baltimore. Abdullah rushed six times for 14 yards and caught three of five targets for 29 yards during Thursday's 30-23 loss to the Vikings. Abdullah rushed for 22 yards on 11 carries and snagged two passes for 13 yards and a touchdown in Sunday's 27-24 win over Chicago. Abdullah rushed 11 times for 52 yards and a touchdown while adding a three-yard catch on two targets in Sunday's 38-24 win over Cleveland. Abdullah rushed 21 times for 48 yards and a touchdown, but also lost one of his two fumbles during Monday's 30-17 win over the Packers. He also caught his lone target for nine yards. 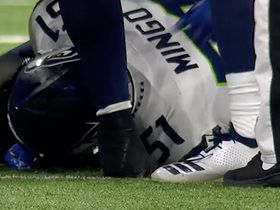 Detroit Lions running back Ameer Abdullah fumbles on a punt return and Seattle Seahawks linebacker Barkevious Mingo recovers the ball. NFL Network's Tom Pelissero and Stacey Dales discuss what the Detroit Lions' offseason priorities should be. 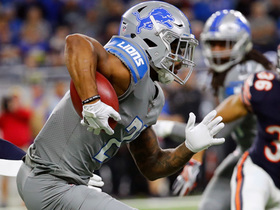 Detroit Lions running back Ameer Abdullah rushes 7 yards for a touchdown. 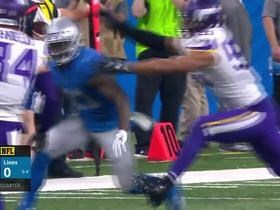 Detriot Lions running back Ameer Abdullah makes defender miss and chops his way inside the 10. 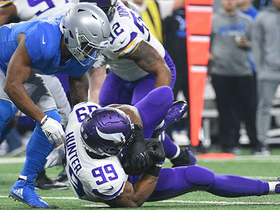 Detroit Lions quarterback Matthew Stafford and running back Ameer Abdullah struggle with the handoff and the Minnesota Vikings recover the fumble. 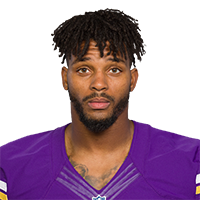 Detroit Lions running back Ameer Abdullah makes a nice move on Minnesota Vikings safety Harrison Smith and picks up 18 yards. 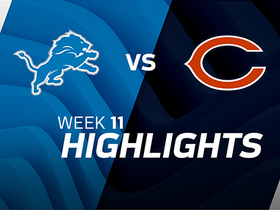 Watch the highlights from the Detroit Lions 27-24 victory over the Chicago Bears in Week 11 of the 2017 NFL season. 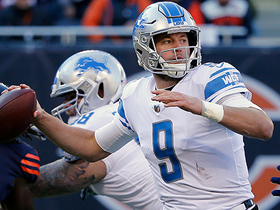 Detroit Lions quarterback Matthew Stafford throws a 2-yard touchdown to running back Ameer Abdullah vs. the Chicago Bears in Week 11 of the 2017 NFL season.